Description: Extra 6425 east rolling downgrade near the Becket/Washington town line. Description: Some "added impetus" at the rear of the extra 2802 west. 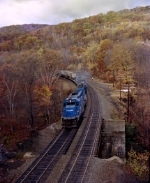 Description: With a train of bare tables, northbound CR 6372 goes in on the Port Road Branch as seen from Perryville tower. Description: TV-8 rolling downgrade at the "Art Colony", the bridge spanning the Westfield River marks the boundary between Chester in the foreground and Middlefield, in the background. Description: ALEN rolls west at CP Burn with 153 cars.